Writing bad checks can cause trouble in several different ways. 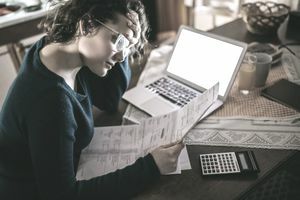 You’re likely to pay significant fees, you may lose the ability to write checks in the future, you risk legal problems, and your credit can suffer. If you’ve already written a check (or are thinking about it), learn what can go wrong—and what you can do to avoid problems. If you received a rubber check, see How Returned Checks Work. You’ll find out what caused the problem, how to solve it, and how to prevent it in the future. What Is a Bad Check? A bad check is a check that a check writer’s bank does not pay on. When you write a check, the payee (the person, business, or organization that you’re paying) typically deposits the check to their bank account or tries to cash it. That bank then submits the check to your bank—possibly very quickly, by converting it to an electronic check. At that point, your bank verifies if you have funds available in your account to complete the payment. A payment you expected (like direct deposit from your job) did not hit your account. A deposit or payment to you has not yet cleared in your account. Using your debit card created a hold in your account (possibly for more than you really spent). Somebody deposited a check that you wrote long ago but forgot about. Whether it happens on purpose or by accident, the results are typically the same—assuming you don’t make a habit out of it. So, what happens if you write a bad check? Bad checks can cost you money that you don’t have. You usually pay a fee to whoever you wrote the check to (typically around $25), and that business or organization may refuse to accept your checks going forward. Your bank also charges fees for bad checks. They return the check to a business unpaid and ding you with a bounced check fee. Also known as insufficient funds fees, those charges are often around $35. Your bank might decide to pay the check as a “courtesy” and charge overdraft fees (again, often around $35, or they may call it a loan and charge you interest). Learn more about How Overdraft Protection Plans Work. If you’re keeping count, that’s at least two fees that you’re paying. There’s also a good chance that your payment (whatever you wrote the check for) will be considered “late,” so you could face late payment penalties as well. Another risk is that you’ll end up in a database of people who write bad checks. Banks may not allow you to open a checking account, and some merchants might not accept checks from you. ChexSystems is just one company that tracks bad checks, usually for financial institutions. Retailers also use check verification services to find out if they should accept your check at the checkout counter (before they let you walk out with merchandise). Is it Illegal to Bounce Checks? Writing bad checks can be a felony. Each state has different laws, limits, and procedures, but you should know that you can end up in jail for writing bad checks. It probably won’t happen if you accidentally bounce one or two checks, but repeated incidents (and “biggies”) can be a problem. What’s more, you may still have to deal with legal fees, mandatory education programs, and a tarnished criminal record. For more details, see I Bounced a Check. Now What? Depositing a bad check to your account can also have severe consequences. This is a common occurrence with cashier’s check fraud, where victims deposit a fake check and withdraw or transfer funds out of their account. You are responsible for deposits you make to your account, and you will most likely owe your bank for any funds you withdraw. The legal consequences, again, depend on state law. Collectors may be aggressive, but jail time is probably not the first outcome. If you receive legal notices, contact a local attorney to find out what options and risks exist. A bounced check won’t show up on your traditional credit reports. However, companies like ChexSystems keep a record of your banking activity. If you do not have a solid credit history (because you have not yet built up your credit), lenders, employers, and insurers may look at “alternative” credit rating agencies to decide whether or not to do business with you. Those agencies may include information about bad checks, which will hurt your chances. Learn more about your credit by reading What is Credit? Also, a business that you write bad checks to might send your account to a collection agency. If that agency reports activity to the major credit bureaus, your traditional credit scores will suffer. If you’re bouncing checks, take steps to avoid the problems above. Keep track of how much you have available in your checking account, and remember that there’s a difference between your account balance and your available balance. It’s easy to find your balance if you log in online or use an app on your mobile device. For a quick account check, text messages can be very helpful. Balance your checking account so that you know how much you have now and how much you’ll have tomorrow. There are several ways to balance your account—pick the one that works best for you. Keep some extra cash in your account as a buffer. Mistakes happen, and sometimes an extra $10 or $20 can help you avoid fees and headaches. Write fewer checks. If you spend with cash, you always know what you can afford. Of course, cash isn't always safe or practical. But debit cards are another good option for spending the money from your checking account. Can You Still Buy Time by Floating Checks? You Bounced a Check - Now What? How Fast Is Money Deducted After Writing a Check? What Happens When You Write (or Deposit) a Check? What Counts as a Substitute Check, and Why Should you Care?